While the award-winning stories reflect themes of conflict, corruption and disaster, they also show how, in a hyper-connected world, these dangers spill over and quickly present global perils. Journalists covering these events now face a more hazardous climate with a growing number of limitations to free speech across the globe. As part of confronting this new reality, the OPC joined last year with the Frontline Freelance Register, Reporters Without Borders, the Committee to Protect Journalists, DART, other advocacy groups and 90 news organizations to sign the Global Safety Principles and Practices for protecting freelancers in dangerous overseas assignments. Kai Ryssdal, host and senior editor of American Public Radio’s Marketplace,” will emcee the awards night, with the OPC honoring David Fanning, founder and executive producer at large of FRONTLINE, with the President’s Award. Jason Rezaian, journalist and former Tehran bureau chief for The Washington Post, who was released from Iran in January after more than 18 months in jail, will light the press freedom candle in memory of journalists who have died in the line of duty in the past year and in honor of those imprisoned or missing. Bassam Khabieh, international photojournalist with Reuters, will receive The Robert Capa Gold Medal Award, which honors the best photographic reporting from abroad requiring exceptional courage and enterprise. Mr. Khabieh is being honored for “Field Hospital Damascus,” with images that put into perspective the tremendous danger and difficulties facing journalists in Syria today. There were 486 entries in this year’s competition. The OPC Awards will be live-streamed. Please follow us on Twitter @opcofamerica and tweet using #OPCAwards. Detailed information and photographs will be posted on the OPC website at www.opcofamerica.org. Contact patricia@opcofamerica.org or (212) 626-9220 if you wish to cover the award presentations in person. 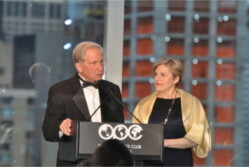 The Overseas Press Club of America was founded in 1939 in New York City by a group of foreign correspondents. 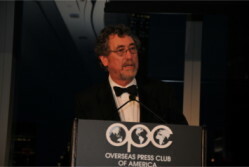 The OPC seeks to maintain an international association of journalists working in the United States and abroad; to encourage the highest standards of professional integrity and skill in the reporting of news; to help educate a new generation of journalists; to contribute to the freedom and independence of journalists and the press throughout the world, and to work toward better communication and understanding among people.